Most users apply one drop for both eyes while some use one drop per eye and any leftover apply on their forehead or around their mouth as the product is all-natural and safe for use on your entire face. Apply twice per day to clean, dry skin. Gently massage the serum under and around the eyes until it’s fully absorbed. For best results, use first thing in the morning and apply once again in the evening. 1. Always keep the white safety tip on the end of the product when not in use. 2. The airless syringe’s pump has a security lock. This is important for two reasons. First, it creates an airtight environment for the serum when the product is not in use. Locking the product ensures the pump will be ready to drip product efficiently next time it’s used. Second, the lock ensures the product won’t drip or spill any product. This way there is no wasted product. 3. It’s very important that when the product is in its locked position (the product locks by turning the cap in a clockwise direction) that an attempt to dispense serum is not made. Attempting to draw serum from the applicator tip when the pump is in a locked position can cause the pump to break. When the pump breaks, it’s extremely difficult to dispense the product and use it in a normal manner. For best results and the highest caliber of functionality, always lock the product by twisting the cap in a clockwise direction after each use. Accordingly, a counter-clockwise twist of the cap will unlock the product when it’s time for use. Is the product guaranteed to work for everyone? Due to the high cost of clinically tested ingredients, and factual, proven results in independent laboratory testing, we are positive that you will be satisfied with your Elite Serum Rx purchase. Should you have specific questions about expectations, please contact customer service prior to ordering. 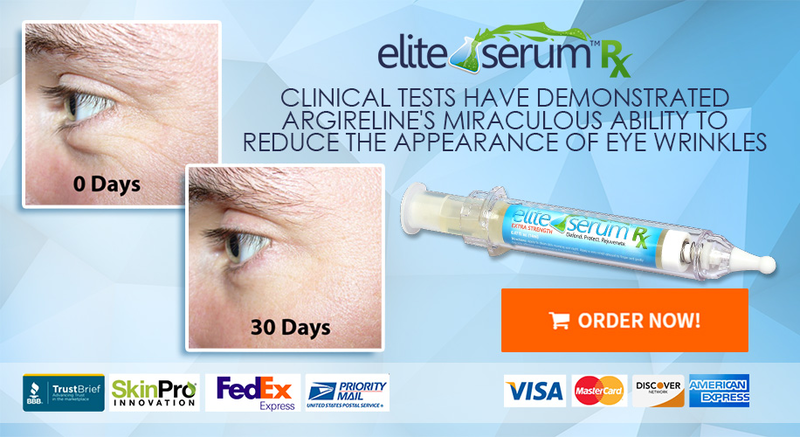 Elite Serum Rx is not and does not purport to be a ‘miracle’ or ‘instant’ cure. Skin care, much like a health and fitness routine, is a gradual, therapeutic process. At SkinPro, we believe in science. This means that we spare no expense in designing the right formulation with the highest concentration of pharmaceutical grade skincare and anti-aging peptides. Our cosmetic pharmacists have worked tirelessly to formulate a product that actually does what it says it will do. This is a therapeutic treatment designed to significantly reduced wrinkles, fine lines, dark circles and puffiness around and under the eyes. We do not make any guarantees that Elite Serum Rx will work for everyone, because simply put, there are symptoms of aging that not even cutting edge science can overcome. There isn’t one single product or treatment in the world that works for everyone, as we all share different skin types and associated ailments. In our six years of existence, however, we have aggregated ten’s of thousands of satisfied customers who have had incredible experiences and results with Elite Serum Rx. Some of those users can be found on our Official YouTube Channel. Others can be found on our growing internal database of Elite Serum Rx reviews. We do also offer a satisfaction guarantee, meaning that if, following a trial period of 45-60 days, you find that Elite Serum Rx isn’t providing you with the results you like to see then we will have a skin care consultant contact you to complete a skin care analysis. Based on the recommendation from the skin care consultant, a full size replacement product will be sent to you at no charge. We do offer close to 40 products under various brands housed under our parent company, SkinPro, and we are confident that our highly trained staff can align you with a product that will cure your ailment. Currently, Elite Serum Rx is not manufactured in a sample or trial size because it’s not an “instant” product. To fully judge and a product in this sector it’s only fair to judge it based on a full 30 day usage period. To fully unlock the results Elite Serum Rx will potentially have on your appearance, you must use it twice daily, for a period of 30 days. Elite Serum Rx is not and does not purport to be a ‘miracle’ or ‘instant’ cure. Due to the high cost of clinically tested ingredients, and factual, proven results in independent laboratory testing, we are confident that you will be satisfied with your Elite Serum Rx purchase. How Long Should I Use Facial Serums? This answer is unique to every user. Studies show that discontinued use will slowly bring back signs of aging that our product targets. Many customers find that using this product on a daily basis is the best way to view noticeable results that won’t fade over time. Other customers find success and “cycle” the product, using it for one month, then rest for one month without it. View your skin on a weekly basis and make mental notes on the signs of aging that you are targeting, and react accordingly. For daily users, we set up the replenishment program, which offers the product at a 33% discount and mails it to your address each month in order to not miss any time.